THE classic off-road bike scene showed its strength once again this weekend, February 20-21, as riders and enthusiasts packed in to Telford’s International Centre for the premier event of the year. Sponsored by Hagon Shocks, the Classic Dirt Bike Show welcomed thousands through the doors and traders in attendance reported healthy sales of off-road parts, spares, kit and accessories. Adding to the buzz in the three busy halls was the presence of off-road sporting stars such as speedway legend Barry Briggs and trials ace and all-round racer Nick Jefferies. The pair kept the crowds entertained during on-stage interviews with Classic Dirt Bike magazine editor Tim Britton, and also regaled fans with stories from their careers at the traditional Saturday night dinner hosted by the show organiser. Displays were a major element of the event too, and among the gems were a selection from show sponsor Hagon Shocks. 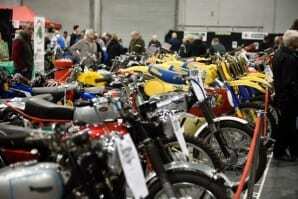 The leading industry name plans to bring together rare Hagon bikes for a major display at the 2018 show which will coincide with its 60th anniversary year. It was a successful weekend for Adrian Moss too, with the Rickman Motorcycles managing director claiming the Best In Show award for his 1964/65 Rickman Mk III.